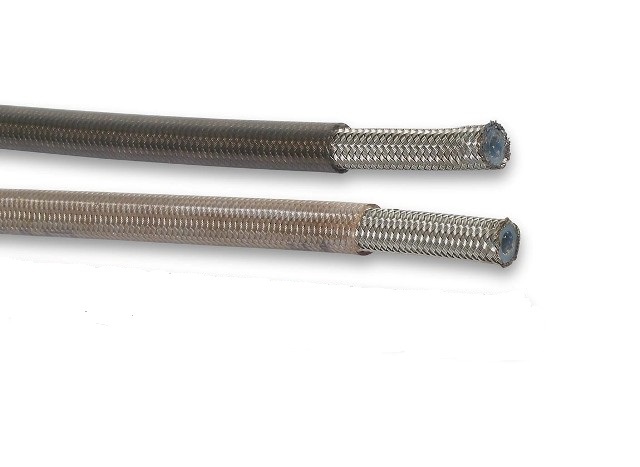 Speed Flex Hose Is intended for SPEED-SEAL hose ends ONLY. Use in every application. Now very popular for fuel systems. Earls Speed-Flex PTFE lined stainless braided hose is the best. With a 040" Wall thickness in sizes #3 #4 #6 #8. Nobody Beats Earl's in PTFE. 600002ERL -2 .040" SOLD BY THE FOOT IN CONTINUOUS LENGTH. Speed-Flex .040" WALL PTFE Hose. Use Speed-Seal Ends in Aluminum, Steel, or Stainless. 600003ERL -3 .040" SOLD BY THE FOOT IN CONTINUOUS LENGTH. Speed-Flex .040" WALL PTFE Hose. Use Speed-Seal Ends in Aluminum, Steel, or Stainless. 600004ERL -4 .040" SOLD BY THE FOOT IN CONTINUOUS LENGTH. Speed-Flex .040" WALL CARBON LINED PTFE Hose. Use Speed-Seal Ends in Aluminum, Steel, or Stainless. 600006ERL -6 .040" SOLD BY THE FOOT IN CONTINUOUS LENGTH. Speed-Flex .040" WALL CARBON LINED PTFE Hose. Use Speed-Seal Ends in Aluminum, Steel, or Stainless. 600008ERL -8 .040" SOLD BY THE FOOT IN CONTINUOUS LENGTH. Speed-Flex .040" WALL CARBON LINED PTFE Hose. Use Speed-Seal Ends in Aluminum, Steel, or Stainless. 600010ERL -10 .030" SOLD BY THE FOOT IN CONTINUOUS LENGTH. Speed-Flex .030" WALL PTFE Hose. Use Speed-Seal Ends in Aluminum, Steel, or Stainless. 610003ERL -3 10 ft .040" Speed-Flex .040" WALL PTFE Hose. Use Speed-Seal Ends in Aluminum, Steel, or Stainless. For Brake and High p.s.i. Systems. 610004ERL -4 10 ft .040" Speed-Flex .040" WALL CARBON LINED PTFE Hose. Use Speed-Seal Ends in Aluminum, Steel, or Stainless. For Brake and High p.s.i Systems. 610006ERL -6 10 ft .040" Speed-Flex .040" WALL CARBON LINED PTFE Hose. Use Speed-Seal Ends in Aluminum, Steel, or Stainless. For High p.s.i Systems. 610008ERL -8 10 ft .040" Speed-Flex .040" WALL CARBON LINED PTFE Hose. Use Speed-Seal Ends in Aluminum, Steel, or Stainless. For High p.s.i Systems. 610010ERL -10 10 ft .030" Speed-Flex .030" WALL PTFE Hose. Use Speed-Seal Ends in Aluminum, Steel, or Stainless. 620003ERL -3 20 ft .040" Speed-Flex .040" WALL PTFE Hose. Use Speed-Seal Ends in Aluminum, Steel, or Stainless. For Brake and High p.s.i. Systems. 620004ERL -4 20 ft .040" Speed-Flex .040" WALL CARBON LINED PTFE Hose. Use Speed-Seal Ends in Aluminum, Steel, or Stainless. For Brake and High p.s.i Systems. 620006ERL -6 20 ft .040" Speed-Flex .040" WALL CARBON LINED PTFE Hose. Use Speed-Seal Ends in Aluminum, Steel, or Stainless. For High p.s.i Systems. 620008ERL -8 20 ft .040" Speed-Flex .040" WALL CARBON LINED PTFE Hose. Use Speed-Seal Ends in Aluminum, Steel, or Stainless. For High p.s.i Systems. 620010ERL -10 20 ft .030" Speed-Flex .030" WALL PTFE Hose. Use Speed-Seal Ends in Aluminum, Steel, or Stainless. 6000031ERL -3 Clear SOLD BY THE FOOT IN CONTINUOUS LENGTH Speed-Flex PTFE Hose W/Clear Jacket, -3 For High p.s.i Systems. (PTFE Liner) Use Speed-Seal Ends in Aluminum, Steel, or Stainless. 6000032ERL -3 Smoke SOLD BY THE FOOT IN CONTINUOUS LENGTH. Speed-Flex PTFE Hose W/Smoke Colored Jacket, -3 For High p.s.i Systems. (PTFE Liner) Use Speed-Seal Ends in Aluminum, Steel, or Stainless.